March 2, 2016 - David P. Gelios, special agent in charge of FBI Detroit Division, announced today the arrest of 23-year-old Johnathan Tafoya-Montano of Texas . Mr. Tafoya-Montano was working as a flight attendant on an American Airlines Flight 1418 that was traveling from Dallas, Texas to Detroit on February 1, 2016. During the flight, Mr. Tafoya-Montano went into the rear lavatory, set fire to paper towels, he then came out of the bathroom and stood outside it. Moments later he pretended to have “discovered” the fire. He reported the fire and then extinguished the flames. The fire was reported to the captain, the captain notified the control tower, and the aircraft, already on approach to land at Detroit Metropolitan Airport, was granted emergency status. 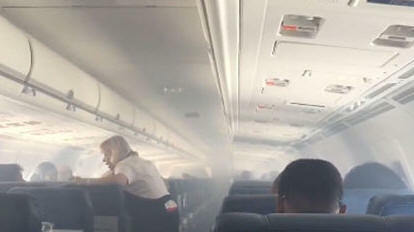 The aircraft landed without incident and all passengers and flight crew safely disembarked. An investigation revealed that Mr. Tafoya-Montano had set the fire himself, and he eventually admitted to such. Mr. Tafoya-Montano has been charged with destruction of aircraft or aircraft facilities” and false statements or entries generally. He was arrested on March 1, 2016, and his detention hearing was earlier today. He was released on bond with conditions. One of the conditions included a prohibition from flying without permission of the court. According to court documents, Tafoya-Montano gained employment with American Airlines 1 1/2 years ago. He had worked for a doctor’s office in New Mexico just prior to working for American Airlines. In 2014, Tafoya-Montano was arrested for DUI and was convicted.